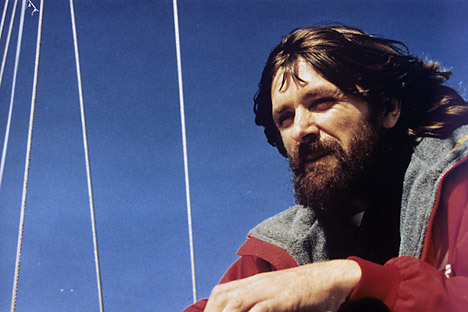 62-year old Fyodor Konyukhov’s boat is equipped with a special radio beacon that automatically transmits its bearings, allowing the Ocean Rowing Society International to monitor his mission. Russian traveller Fyodor Konyukhov, who is crossing the Pacific Ocean solo in a row boat, has been at sea for three weeks, covering almost 2,500 km on the way from Concon, Chile to Australia. On Monday, January 13, his Tourgouak boat has travelled 128 km, the London-based Ocean Rowing Society International, which is monitoring his mission via satellite, said. The boat is equipped with a special radio beacon that automatically transmits its bearings, thus allowing Rowing Society specialists to calculate the distance Konyukhov travels every day. “It’s been three weeks since I left Concon. On one hand, these weeks just flew by, but on the other hand, it feels like it’s already been three months. The ocean can certainly change a human being quite rapidly. A person must accept the ocean. Fighting is futile, and trying to conquer the ocean is hopeless. You have to merge and become one with it no matter how indistinguishable and infinitesimal it makes you feel. Only then do you have a chance to reach your destination. This is strictly my approach and so far, it hasn’t failed me yet,” Konyukhov said by satellite telephone. He recalled his start scheduled to coincide with his birthday. “I still remember, just like yesterday, celebrating my 62nd Birthday in Concon. Exactly one month ago. It was my goal to depart on my birthday, but nature decided otherwise. The strong south-west wind kept me and Tourgoyak at bay. So I changed the start day to December 14th, but even then I guess it wasn't my time yet. Four days later, the onboard accumulators failed completely and I had to turn back. The decision to come back to port was one the most difficult decisions I had to make. But in hindsight, it was a necessary, although not welcomed, introduction to rowing the Pacific. The frantic and stressful three days of repairs and installation of a new set of batteries is a whole another story. The second start was on December 22nd and it went much better,” the traveller said. On January 10, Konyukhov cooked fish soup for the first time in 18 days since the start of his voyage. He made the soup and some sort of sashimi from tuna fish he had caught with a spinner to treat himself to a real dinner after days of eating processed food. On January 12, however, he said the weather was favourable: the east wind of 12-15 knots and the waves pushing the boat along the course. “The conditions are pretty much ideal. The sun is weak but there is enough sunlight hitting solar panels to charge accumulators on board,” he added. There are still 11,703 km to go to Brisbane, Australia, if measured by straight line. However, if Konyukhov had tried to sail along the straight route, he would never have reached Australia because of headwinds and currents. The traveller chose to go in a wide arc. Starting in Concon, Chile, Konyukhov headed up north to the point where currents turn towards Australia. In the Pacific Ocean, the Peruvian Current (Humboldt) passes along the coast of South America from south to north. It is one of the largest ocean currents in the world. Konyukhov’s goal was to catch the Peruvian Current and ride to 15-20 degree of the Southern Latitude. There he will enter the zone of the southerly Trade Winds which will allow him to turn west towards Australia. A map of the Pacific Ocean currents clearly shows that one can arrive to Australia by means of the Trade Winds while slowly navigating south. Konyukhov will have to work hard to not be caught up in the East Australian Current which would divert him to New Zealand. However, if Konyukhov lingers too much in the Trade Winds there will be a high risk of getting swept into the Equatorial Current which would turn him back to south-east, the Ocean Rowing Society International said. Konyukhov said he was “fully adjusted” to the rowing routine. “Each day I take time to inspect Tourgoyak from bow to stern looking for any signs of leakage. The tropics have welcomed me with warm, even hot temperatures. I 'm heading west and a bit north,” he added. If successful Konyukhov would be the ninth person in the world to row the Pacific solo and the second person to row the South Pacific solo. Konyukhov hopes to get from Chile to Australia in 200 days.